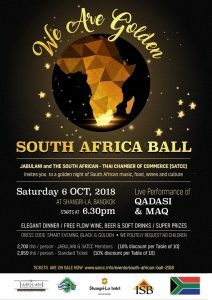 Bangkok (Thailand) – September 29, 2018 (travelindex.com) – The South Africa Ball, brings a golden night of South African culture and celebrating 25 Years of Diplomatic Relations with Thailand alongside with the Centenary of Nelson Mandela’s birth, will be taking place on Saturday 6th October 2018. Proudly hosted by JABULANI and the South African – Thai Chamber Of Commerce (SATCC). The South Africa Ball will support and fundraise for two worthwhile charity organisations: The Rice Seeds Child Sponsorship Program and The Hoedspruit Endangered Species Centre (Hesc) Rhino Orphanage.